Around the world today, evangelical Bible scholars are giving hell a serious second look. Would the God who gave his Son to die for sinners finally keep billions of them alive forever to torment them without end? Does Holy Scripture require such a conclusion–or offer a different vision? More than thirty years ago, Edward’s 500-page book, The Fire That Consumes, challenged the traditional doctrine of everlasting conscious torment. When John 3:16 says the options are eternal life or perish, Edward shows that we can take that at face value. Hell is the second death, the wages of sin. Eternal punishment is eternal destruction. 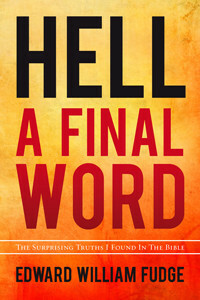 Along the way, Edward relates his own personal journey in understanding the nature of hell, Most importantly, he leads the reader through the whole Bible to see what we have missed, then guides us through church history to understand where the idea of unending torment originated, as well as the idea that everyone finally will be saved. The human story behind Edward’s work on this subject is now the basis of an award-winning feature movie. “Hell and Mr. Fudge,” starring Mackenzie Astin and Keri Lynn Pratt, is presently showing in selected cities across the USA and Canada, with DVDs and possibly television showings to follow. Click here for a trailer, casting, synopsis, and scheduled showings. In addition, here are two additional books, a mind-challenging video, and an exciting international website! The Fire That Consumes, Edward’s exhaustive book that examines every biblical passage on this subject. Christianity Today calls it “the standard reference” for its point of view. Click here for more details. Two Views of Hell is a respectful debate between Edward (conditional immortality) and Covenant Seminary theologian Robert A. Peterson (unending conscious torment). Each man presents his own view and then responds to the other. Click here for more details. Video — How the great majority of Christians came to teach unending conscious torment is as fascinating as any mystery or spy novel. In this video of a lecture attended by 800 patrons of the Lanier Theological Library in Houston, Edward identifies scores of generally-overlooked Scriptures, then leads a tour through some paths of church history less well travelled, and haunted by pagan philosophy, medieval law and Reformation politics. Click here. Website — Click here to go to Rethinking Hell. International in scope and professional in quality, this important website features many helpful interviews, podcasts, articles and discussions. Edward Fudge, author of The Fire That Consumes, joins RethinkingHell.com contributor Chris Date to discuss his story, the recent movie that tells it, and his latest and final book on the topic of final punishment, Hell: A Final Word.